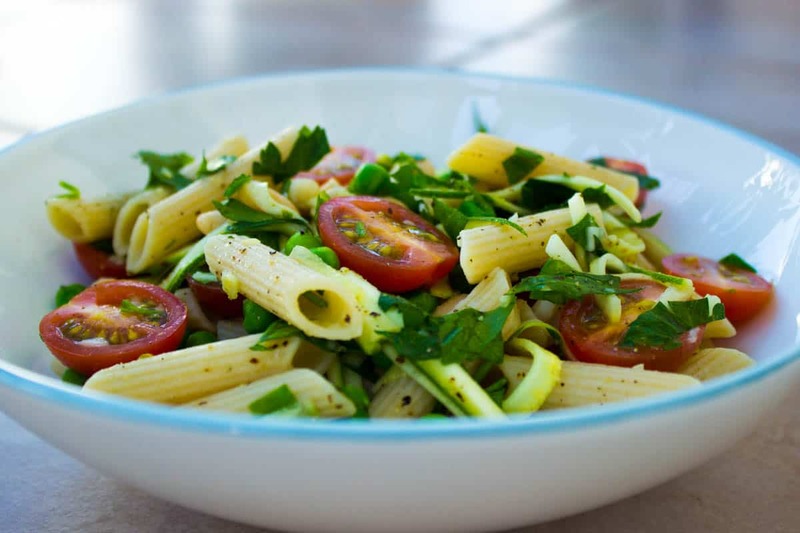 This is one of those recipes that basically does what it says on the tin: it’s a quick, tasty and nutritious mid-week pasta meal that takes approximately 15 minutes to prepare. The lovely thing about this Parsley, Pea and Tomato Pasta is that it’s so satisfying – mainly because it’s so quick to make yet also so delicious. The part I really love though is that it’s a great way to get fresh vegetables into your diet without really noticing you’re eating them raw! Having a mandoline (I know, I keep harping on about my mandoline, I’m in love) really does make a difference here as it slices the zucchini/courgette really finely, so it folds into the pasta and isn’t like crunching down on raw vegetables. If you have a mandoline – great, if you don’t, just slice or grate the zucchini very thinly. One word about garlic-infused olive oil – it’s really easy to make your own and I highly recommend doing it. It’s a great way to get the taste of garlic into food if you don’t have time to crush some cloves, or want to add a more subtle flavour to a dish. Find an airtight glass jar, crush several cloves of garlic into it (the more you use, the stronger the flavour), fill the jar with extra virgin olive oil and seal it. Your oil will infuse in about a day, will keep for several weeks in the cupboard, and is great on salads and pasta. Cook the pasta in a large saucepan according to package instructions (rice pasta usually takes about 10 minutes in boiling water). 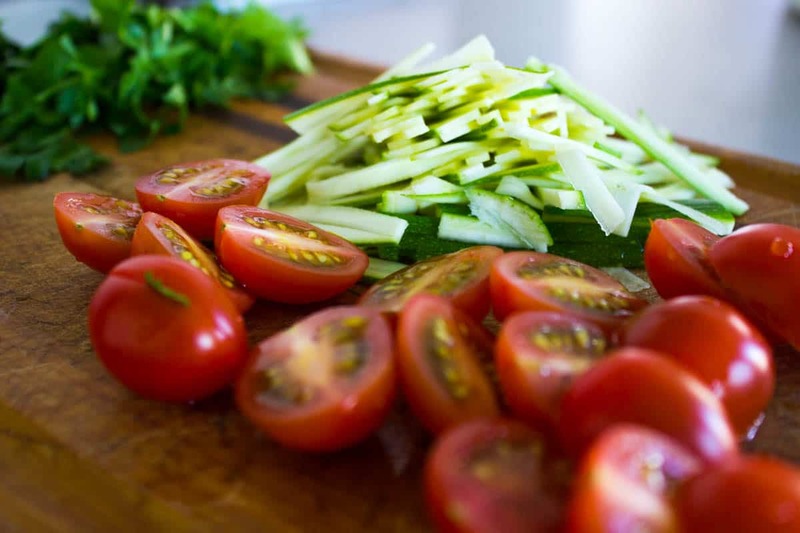 While the pasta is cooking, cut and prepare the vegetables and other ingredients. Remove the pasta from the heat, drain, rinse and place back in the warm saucepan. Add the parsley, tomatoes, peas, beans, courgette and garlic oil and toss everything together. Season to taste with sea salt and black pepper, and serve immediately. Note: If you’re using brown rice pasta be aware that it doesn’t work very well as a cold dish. Once the pasta cools it becomes quite hard and less tasty!